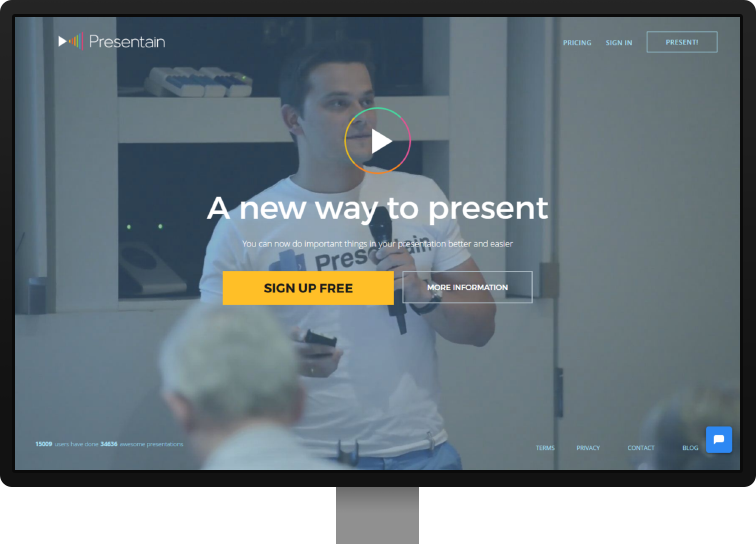 Presentain’s iOS and Android apps helps presenters and their audiences connect on a whole new level. The application lets a presenter broadcast slides and get audience feedback in real-time. It also allows audience members to send questions to the presenter, effortlessly connect with presenter’s social media accounts, and even record the presentation. Presenters can broadcast the slides on a projection screen and straight to audience members’ smart devices. Lets you record the presenting session to get a slidecast with voiceover. A presenter can control presentation access, recorded slidecast, and slide sharing. By creating and conducting polls and surveys, a presenter can engage the audience with post-insights. Stats show which answer has been chosen most and which poll is the most popular. Presentain allows audience members to send questions during the presentation, and a presenter can show them on the screen while answering. When the audience connects, Presentain offers to join the presentation via social networks. A presenter gets the audience list with contacts. Also, every recorded session contains its own stats. We’ve extended the mobile functional - ‘Upload a presentation’ and ‘Create poll’ options were added, as well as new features: integration with cloud services, embed code feature for web to generate HTML that can be embedded in a site or blog. On a new Presentain logo, we wanted to translate its functional versatility. ​To make our product recognizable and unique, I had to design a simple logo for better memorization and sharp enough to be meaningful. Four basic aspects form the image: seamless action, audio capturing, slideshow capability, and visual engagement. After a couple stages of sketching and refinements, I came up with a simple design that delivers the message and works great in different colour solutions (mono and multi colored) and sizes. There were several challenges on the tech side. Many Presentain users connect to the presentation via one WI-Fi spot. When the internet channel gets overloaded, the connection crashes and Presentain stops working. Also, we needed to minimize a delay between the action on the presenter’s device and broadcasting on the screens. During the development process, we received a request from one of the most valued Presentain customers - US Air Force - to increase the number of connected audiences by 4 times for their great upcoming presentation. We have implemented Node.js in a project backend and updated it to the latest LTS release. This lets us increase synchronization speed with the server and reduce the delay between actions on a presenter’s device and its appearance on the audience’s devices. Also, we used REDIS to store click statuses on the Node.JS server. Considering the request, using Node.js let us increase the maximum number of clients to 10000. Also, we’ve updated a converter to decrease the size of uploaded slides to optimize the connecting speed to the presentation. We added an Internet indicator, so a presenter could make sure the internet will not let him down when he gets on stage. We needed to solve a problem with the real-time presentation uploading progress. To make the indicator work properly, we used Faye to provide message servers for Node.js. In addition, Faye synchronizes polling results when the presenter shows them on the screen. Presentain is being used on four types of screens: smartphone, tablet, desktop, and projector. We’ve enabled on-demand crop, resizing, and flipping of images by using a smart imaging service, Thumbor. We need not store 4 copies of 1 picture in different sizes anymore. As for the iOS version, we have simplified the code by getting rid of global variables. Now, the information transfers between the activities by events. Real-time analyzing and support via Mixpanel and Intercom let us develop effective communication mechanisms with customers for the immediate reactions to their requests and quick bug fixing.